North Korea on Tuesday threatened Japan with nuclear destructions in response to Tokyo's attempts to convince the international community to reject dialogue in favour of applying more pressure on Pyongyang. In an article released by Korean Central News Agency (KCNA), Pyongyang responded to Japanese Prime Minister Shinzo Abe's speech at the UN General Assembly last month, in which he called for "pressure, not dialogue" to force North Korea to abandon its nuclear ambitions. 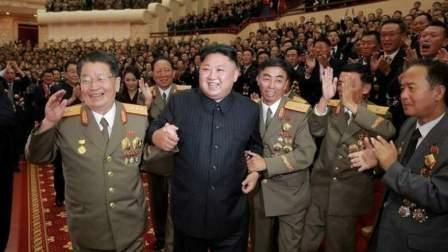 Kim Jong-un's regime accused Abe of "using the 'theory of crisis on the Korean peninsula'" for political purposes, and in particular to "facilitate Japan's militarisation and at the same time strengthen inside unity and save the present rulers driven into a tight corner with corruption and irregularities", reports Efe news. The article added that Abe had already shown his "sinister political goal" with measures such as increasing defence costs and calling snap elections. "Japan's rackets inciting the tension of the Korean peninsula is a suicidal deed that will bring nuclear clouds to the Japanese archipelago. "No one knows when the touch-and-go situation will lead to a nuclear war, but if so, the Japanese archipelago will be engulfed in flames in a moment," the article said, stressing that if the Japanese people, "the first victim of nuclear disaster in the world, are offered in sacrifice owing to handful militarist reactionaries' political aim, it will be a tragedy of the century". Tensions on the Korean peninsula have escalated to its highest levels over Pyongyang's ongoing nuclear weapons programme. After a series of missile launches this year, North Korea detonated a hydrogen bomb at a nuclear testing facility on September 3, which prompted another round of UN sanctions and international condemnation.